Tired of the waste of time producing executive summaries of your plan, or sick of receiving inaccurate or generic onepagers? SummaryPro provides a powerful tool easily generating accurate, attractive and tailored summary schedules. SummaryPro produces customised summary plans directly from detailed plans in MS Project, excel or other planning tools. Allowing you to present a one page summary of your detailed plan in an attractive and easy to digest Plan on a Page (POAP). It enables you to quickly and easily produce, update or modify professional, attractive executive summaries and other ‘plan on a page’ reports. Updating the summary is simple, fast and removes human error and interpretation/transcription errors. SummaryPro saves time and money, easily paying for itself within in months and your audience are reassured that the plan exactly reflects the detailed plan. Simple to update | Repeatable | Consistent | Updated in a few clicks massively increasing speed | Simple to generate templates | Professional look and feel increases the ease of communication and the acceptance. and displays a summary using MS Visio which you can print, save or copy and paste into PowerPoint etc. When you first set up a new report you chose any milestone, task, summary or combination of these to display on any given bar in the summary in the planning tool. 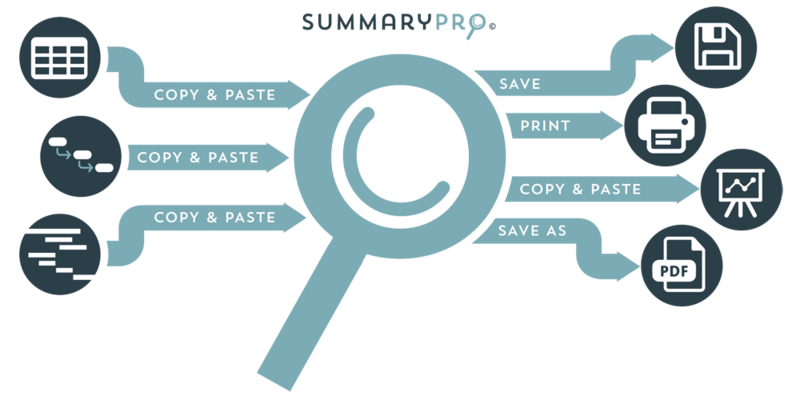 In SummaryPro you set all the formatting and details for every item in the summary so that you get the summary plan that you need for your audience. Updating is a simple matter of copying in the new information, pressing a couple of buttons in SummaryPro and outputting the report. "I designed SummaryPro to make my life easier, faster and more productive and it can do the same for you."